Order from Stitch Thru Time. Call us at 435-648-2141 to speak with our customer service. Stitch Thru Time is well known for our quality Old Fashioned and Retro aprons in Woman, Girl, Boys and Men aprons and our Wonderful custom heating pads. Call us to order over the telephone at: 435-648-2141. If you have any questions concerning sizes call us at 435-648-2141. Our customer service representative will be happy to help you. Size 14 to 16 - large if you like it fitting loosely size 14. If you are larger than 18 please call us to talk about sizing. Please keep in mind apron sizes are not exact. You will have clothes underneath. All of our women aprons come with long apron ties. These sizes may vary depending on body shape, remember these are aprons not form fitting dresses. We make different sizes as we know every body is different and not one size fits all. 1940 Child apron measurements from shoulder to bottom of aprons. Waist measurement below of apron does not include apron ties. 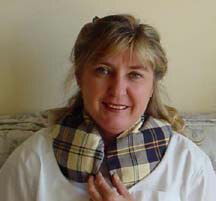 If you have any questions about our heating pads or aprons we will be happy to help you, just call us! We accept Visa Master Card and Discover Card and American Express. We accept money orders or checks for the exact amount of purchase. If you are tall or short give us a call when you order and we will be able to adjust your apron. That is the advantage we have since we make our aprons here in the U.S.A. If you want to know a time frame on your order give us a call at 435-648-2141 and we can tell you when your order will ship. If we have it in stock, it is usually shipped with in 24 hours. If this is a rush we will do whatever we can to get it out promptly. We require a 50% non refundable deposit on special orders. Special orders are not returnable. There is a minimum $15.00 for any custom order and also for order remake change per item. Call us for accurate quote 435-648-2141. All returns must be pre authorized. We do not credit postage and handling. After 30 days pre authorized returns are for credit only, no refunds. We charge a handling fee on all orders. All packages are sent priority mail insured. If this is a gift and you want it send direct to them we have a drop ship address on our secure web page. If you want it gift wrapped we are happy to do that for a charge of $4.75 per item. We look forward to hearing from you, we appreciate your business. Our model is wearing the Aunt Violet apron. We have yellow polka dot cherry available if you like cherries. 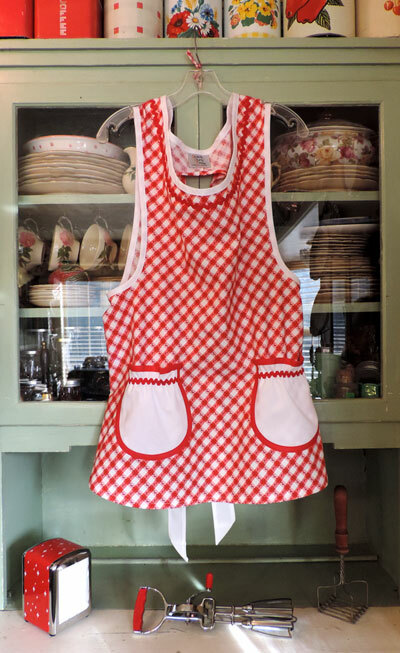 Grandma Old Fashioned red & white kitchen apron, women apron #2166 $49.95, extra large $54.95. 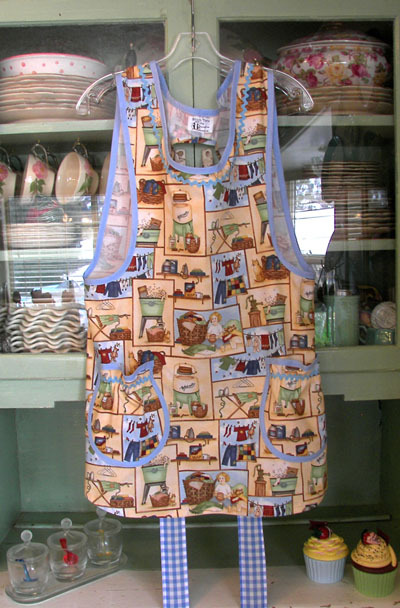 You'll think your still sitting at your Grandma's kitchen table when you wear this old fashioned apron. Also available in Blue and White kitchen apron. Heart apron, the little girl above is about 3 1/2 year old and is wearing a size small. There is still pretty or room for her to grow. We are out of the fabric above but do have other floral and many other pretty prints you may have the child heart apron in. You may get matching mother daughter aprons. All our aprons are 100% washable. Mother Daughter matching aprons in many of our other fabrics in this pretty heart apron. Grandma apron in Good Old Days #2070. If comes with round or square pockets. 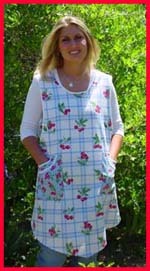 A comfortable old fashioned apron that rests on your shoulders with pretty round pockets. Darling good old days with old time clotheslines, ironing boards, old wash tubs and old fashioned washing machine. A little girl with her teddy bear by a basketful of clothes. Pretty handmade quilts on a clothesline are just some of the nostalgic scenes in this beautiful retro styled apron. 1940 Cupcake Apron. 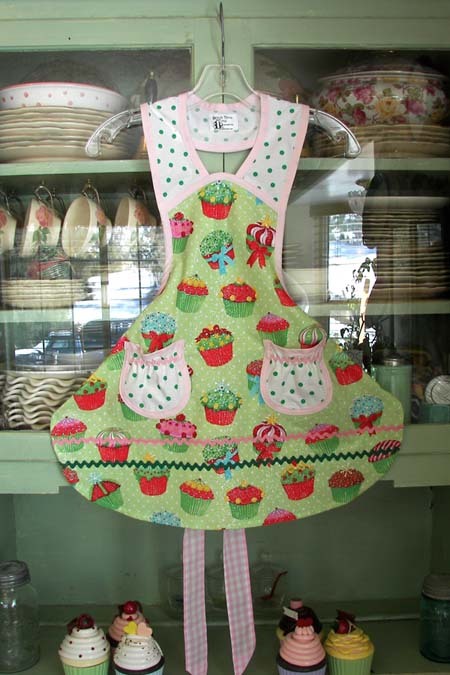 Women Cupcake aprons #2093 $49.95 ex-large $54.95 and girl cupcake aprons #33005 $39.95 Child Large $44.95. This apron is just cute cute cute. Cupcake lovers this apron will bring a smile to your face. Beautifully decorated cupcakes on a soft green with white polka dot background. 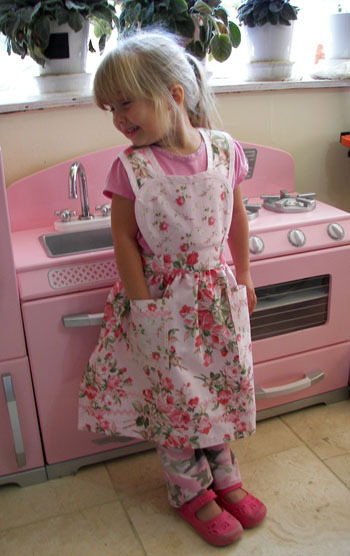 This pretty apron is shown in size child small and comes in mother and daughter matching aprons. 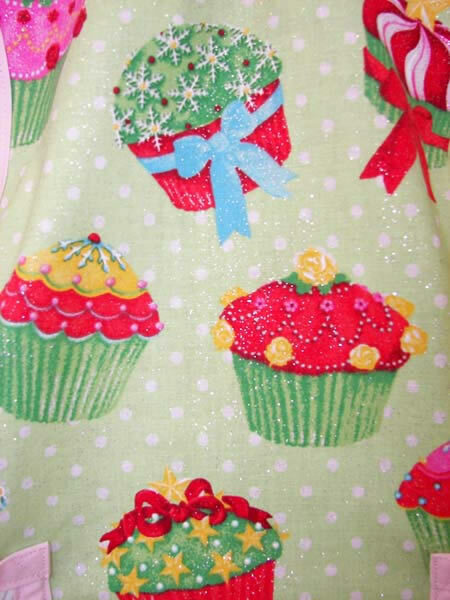 Close Up of Christmas cupcake apron. Silver glitter on a background of green with white polka dot. Cupcakes decorated like you've always wanted your cupcake to look like. 8 x 10" heating pads with pillowcase. Just throw it in the microwave for heat you can enjoy over and over. When the pillowcase gets dirty just wash the pillowcase to keep you heating pad clean. Neck heating pads only $28.95, microwave Neck heating pad contours to your neck and shoulders or wraps around your knee lower back, shoulder, ankle, arm or leg. Heating pad for Plantar Fasciiti - wraps around you foot.